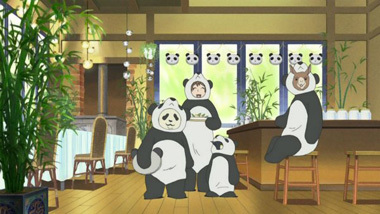 In most respects, it's actually a typical slice of life show, and as such is subject to many of the strengths and weaknesses common to the genre. 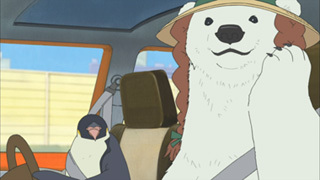 Despite their animal forms, Polar Bear, Panda and Penguin deal with everyday human problems like drumming up business, practicing to get their driver's licenses, and trying to win their crushes' affections. 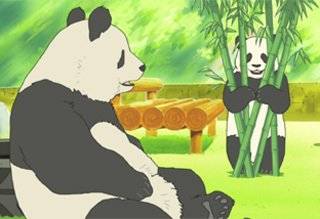 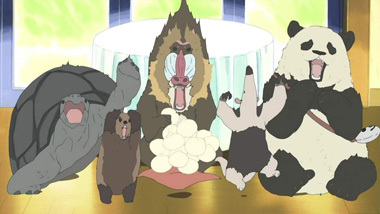 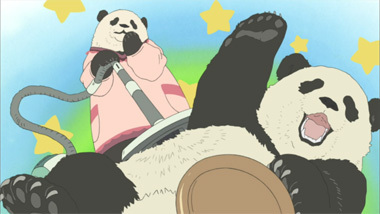 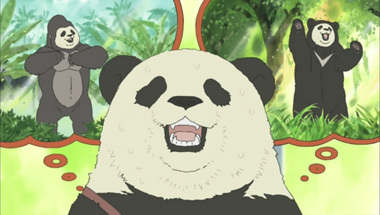 The series does take a turn for the truly surreal when it deals with Panda's part-time job in a petting zoo: one has to wonder why, in a world where humans and animals walk down the street together as equals, there's a need for a zoo where Panda provides "service" by rolling around and acting like a traditional panda bear, but we don't recommend that you think about it too hard. 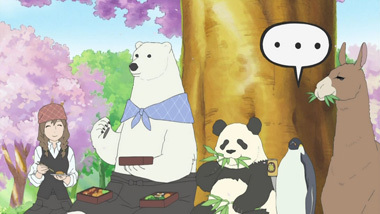 A lot of slice-of-life shows are criticized for having somewhat tepid humor, and PBC is no exception: Polar Bear's penchant for puns gets old, especially for non-Japanese viewers who won't understand the language-based jokes in the first place. 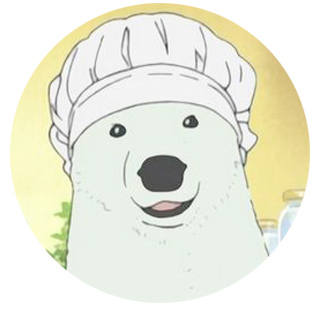 However, sometimes looking for the laugh is missing the point: Polar Bear's tendency to act out puns is less about producing giggles, and more about the fact that he's the kind of person (bear?) 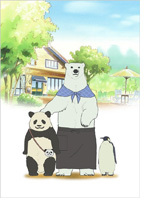 who will go to incredible lengths to illustrate a bad pun. 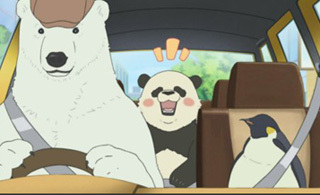 Over the course of the series we get to know Polar Bear, Panda and Penguin very well, and the humor is found in relating to such familiar struggles in the guise of zoo animals. 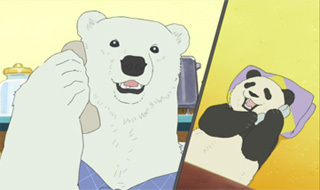 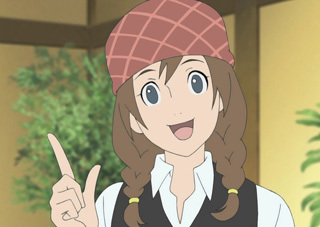 You don't have to be a big anime fan to get a kick out of PBC (although complete newcomers to anime might be annoyed by Polar Bear's pun-addiction), but there's a bonus for veteran fans: all the major characters, and some of the minor ones, are played by respected, prolific voice actors. 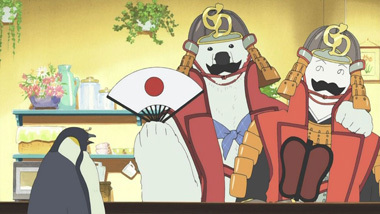 There's great in-jokey fun to be had when you hear a voice you recognize as an evil mastermind from any number of other popular anime coming out of the mouth of a llama or an anteater. 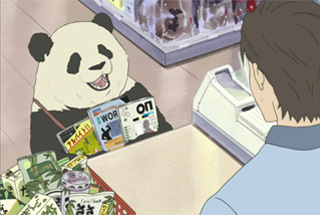 Sometimes modern anime humor is too self-referential and in-jokey, but this works because it's a great bonus for otaku without detracting from the show in any way for those who aren't in on the joke. 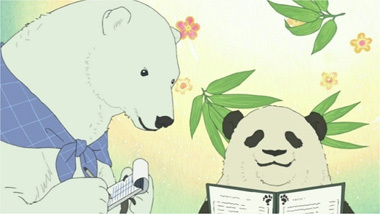 Even if PBC doesn't sound like your cup of tea, do yourself a favor and check out the opening animation, to the tune of "My Invitation" by JP: in addition to presenting the overall feel that the series is going for really well, it's a great music video on its own merits that's definitely worth a watch. 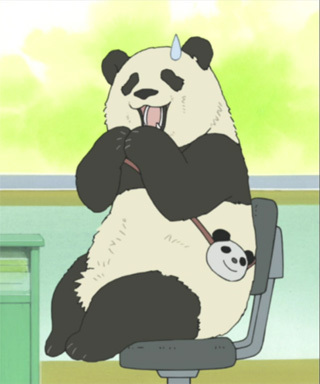 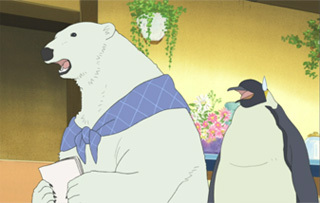 Of course, we could be biased: we already liked penguins, pandas and cafe mocha before Polar Bear Cafe started airing, so this is a show tailor made for us. 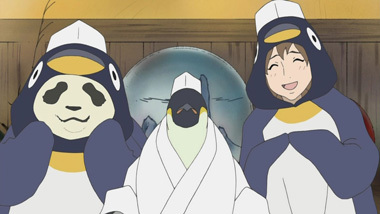 However, even if you haven't given Antarctic life forms a second thought since March of the Penguins, if you're looking for something different to watch, definitely give this delightful TV series a chance. 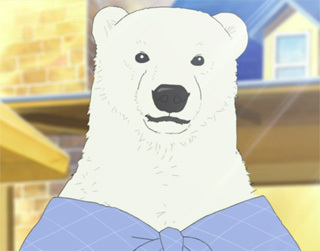 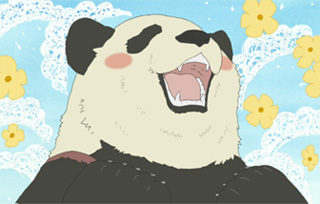 Polar Bear Cafe is currently available streaming on Crunchyroll. 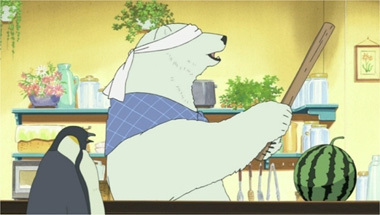 Below: Scenes from Polar Bear's Cafe.